Rural House for groups of 2, 3, 4, 5 or 6 people, built on the ground floor. Possibility to rent another 2 accommodations next to it up to a total of 18 places. I DO NOT APPRECIATE THE BEGGARS OF SOLTER @, NOTICE BEFORE, PLEASE. THE WIFFI IS OF THE VILLAGE OF NAVALUENGA, SOMETIMES IT COLLAPSE AND DOES NOT GO. El Mirador del Alberche 1, your beautiful rural house in the Sierra de Gredos, opposite the natural pools of the Alberche River, passing through the beautiful town of Navaluenga in Ávila. The Mirador del Alberche 1, is a luxurious rural house, ideal to come with families, meetings of friends or couples, because this preciousness, is only for, like a lot of people. It is built of stone, granite walls 1 meter wide, the ceilings are hand carved in wood forming beautiful rustic coffered ceilings, are a masterpiece of cabinetmaking. All this mixed with the good taste of the decoration and the luxury of the finishes. The Mirador del Alberche 1, is ideal in all senses, to enjoy the deserved rest of the travelers and also, to do one and a thousand activities that can be done in Navaluenga. 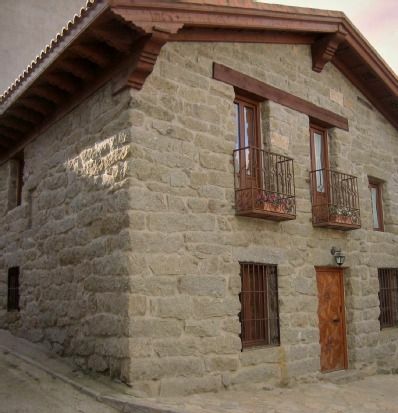 This accommodation is in a strategic location to do all the activities, because of the proximity and because, from the very door of the house, there are hiking trails to the Sierra de Gredos. I encourage you to come and breathe the magic of "El Mirador del Alberche 1", your best option in Gredos. Here in Navaluenga you have to visit a medieval necropolis, a Romanesque-style bridge, a Visigothic tomb, an old foal for shoeing ... all in the wonderful surroundings of the Sierra de Gredos. And if you want to finish that weekend in an even more special way, we recommend that you take a walk through the ancient streets of Ávila, since we are talking about a town that is less than 40 km away. of this medieval city, for those who love the past. You can also visit the museum of nature, with fauna and flora of the area in the town of Barraco about 20 km from here. And if you dare to spend a relaxed weekend and practice any sport in relation to the nature that surrounds you, here you have what you are looking for: hiking, mountain biking, canoeing, rope park, horse riding, golf course, paintball ... and if it's summer time, you have ample natural pools less than 80 m. of your rural accommodation. I ALSO MANAGE 2 PRECIOUS TOURIST APARTMENTS, with 2 bathrooms each, one with a bathtub, 2 rooms, with velux and wood on the ceiling, each, pellet stoves, kitchens with everything up to oven ... and a huge interior patio in the building. Capacity: B up to 7 people and C up to 9 people, total: 17 people. They can be booked together, since they are door to door. To see them, look at my website: www. gredosruralnavaluenga. com, section: Gredos Apartments.